Pet Emergency? Call us right away at (540) 989-4464! If you live in Roanoke or the surrounding area and need a trusted veterinarian to care for your pets – look no further. Dr. Paul Stewart is a licensed veterinarian, treating all types of pets. Your pets’ health and wellbeing are very important to us, and we take every possible measure to give your animals the care they deserve. Avian and Exotic Pet Clinic is a full-service animal hospital and welcomes both emergency treatment cases as well as pet patients in need of routine medical, surgical, and dental care. Dr. Stewart has years of experience treating serious conditions and offering regular pet wellness care. Beyond first-rate pet care, we make our clinic comfortable, kid-friendly, and calm, so your pet can relax in the waiting room and look forward to meeting our veterinarian. We are happy to offer a number of resources that enable you to learn about how to take better care of your pets. Please feel free to browse our site, particularly the informational articles. The best veterinary care for animals is ongoing nutrition and problem prevention, so becoming knowledgeable about preventative pet care is essential to the ongoing success of your animal’s health. If you have any questions, call (540) 989-4464 or contact us and we'll promptly get back to you. Our veterinarian office is very easy to get to - just check out the map below! We also welcome you to subscribe to our newsletter, which is created especially for pet owners. 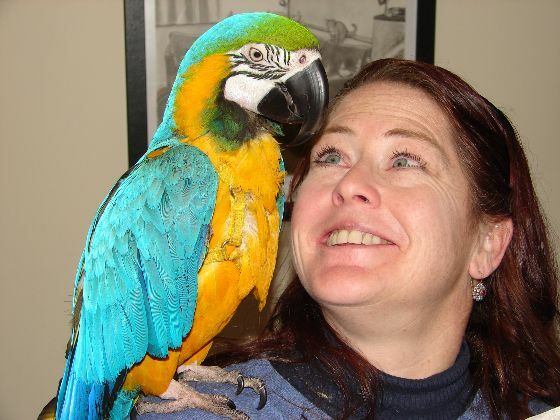 At Avian and Exotic Pet Clinic, we treat your pets like the valued family members they are. Dr. Paul Stewart opened the Avian and Exotic Pet Clinic of Roanoke in 2010 to provide emergency/after-hours veterinary care as well as daytime therapeutic and preventative care to all birds and exotic pets in an environment suitable for their healing. Dr. Stewart obtained his DVM at Kansas State University in 1996 and a Bachelor of Science in Animal Science at Virginia Tech in 1990. For 22 years, Dr. Stewart’s special interests include avian and exotic pet medicine, surgery, ultrasound, endoscopy, radiosurgery, dentistry, and geriatric medicine. He had been the primary care provider for birds and exotic pets in two veterinary practices for 14 years prior to opening this clinic. Dr. Stewart has been a guest lecturer at the Virginia/Maryland Regional College of Veterinary Medicine, The Southwest Virginia Bird Club meetings and Annual Bird Fair, as well as the Roanoke Valley Bird Club. He completed externships at the Topeka Zoo, the National Wildlife Health Lab and has appeared on Animal Planet’s “Wildlife Emergency”. He is also Veterinarian-in-Charge at Mill Mountain Zoo. In Dr. Stewart’s spare time, he enjoys spending time with his family, antique car restoration, camping, canoeing, fly fishing, mountain biking, playing drums and guitar, and drawing wildlife. His family pets include tiny dog Tetley (a Chiweenie), Carris the cat, and Casper the “ghost” boa. "they truly know what they are doing and do whatever they can to help! Amazing staff and Dr. Stewart is the best!!" "It has been a wonderful experience since I have been coming here. I had a bearded dragon who was very sick and sadly didn't make it.Dr.Stewart and his staff tried everything possible to save his life. They are very compassionate and sympathetic, really know what they're doing! You can't go wrong! Very loving, attentive, thorough and professional.Thank you to the staff of Avian and Exotic for your warmth and sympathy at the loss of my "Mushu"." "My mouse Asher was quite sick, and even though he was a working, they immediately took him back and began treatment. Dr. Stewart and his staff are wonderful caring people, and I will always take my exotics to him. Also, Asher is a fat, spoiled rotten, lazy bum."